The cost of a stay at The Old Piggery holiday cottage includes all electricity/gas, a welcome pack (for humans and dogs! ), your first supply of logs for the wood burner, and all bed linen/towels etc. Unlike some holiday cottage owners, we do not charge extra for dogs. To see a selection of recent comments in The Old Piggery visitors’ book, see here. 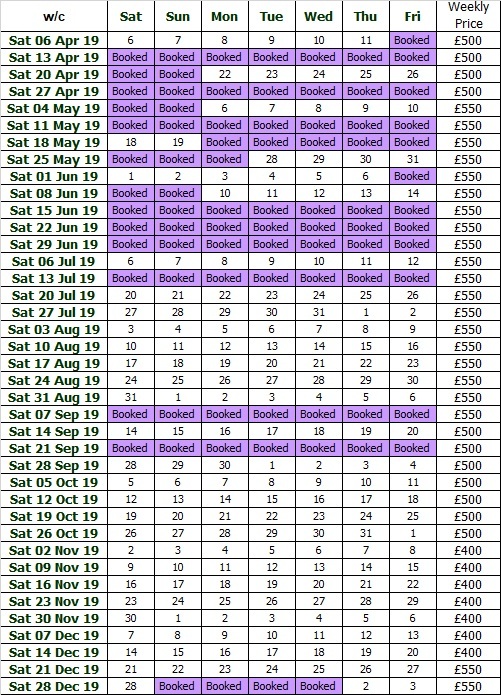 The availability and prices of weekly breaks at The Old Piggery holiday cottage for 2019 are shown in the table below. Alternatively, just get in contact and we can confirm whether the dates you’re interested in are still available. If we can’t fit you in on the dates you’re wanting, you could try our equally dog friendly 3-bedroom cottage in Tideswell – Welyarde.